The global acceptance of these standards will greatly enhance their overall powers. 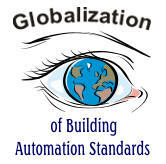 October 2004 hosts several international events that will do a lot to globalize Building Automation Standards. The global acceptance of these standards will greatly enhance their overall powers. http://www.lonworldexpo.com LONWORLD Exhibition and Conference, the world's leading forum for the LONWORKS industry, brings together suppliers, buyers and users of the world's leading device networking standard. This year, the LonWorld workshops will be transformed into a trade mission, enabling companies from Europe, the Americas and Asia to establish relationships with organizations and companies in China. The first ever UPnP™ Summit in China will be held in conjunction with the LonWorks developers conference at the 2004 LonWorld®. More information about the Summit and UPnP technology can be found at http://www.upnp-ic.org and http://www.upnp.org. Echelon Corporation announced the creation of LonUsers España in Spain. The new LonUsers group is the 14th in Europe to support the LonWorks platform. “There is a concrete difference in the adoption rate of systems integration in Europe versus that in the U.S.,” Anto Budiardjo, Clasma President and BuilConn organizer, said. “The endorsing associations for BuilConn Europe will make certain that the focus of the event caters to the unique issues specific to the European marketplace. The discipline of integration in many ways is more mature in Europe than North America, I believe that this has been due to a number of products that have been introduced into the European market place as early as the early 90's. Utilizing open systems is an accepted way of doing things in many parts of Europe, many standard initiatives have been around as far back as the late 80's, some of these still exist but many like FND and BatiBus have either disappeared from the scene or been absorbed into existing standards. The installation of LonWorks based systems from manufacturers such as TAC and Honeywell has been the accepted norm specially in the northern European countries. BACnet seems to be strong in the German markets. The adoption of IT technologies is another story. I do not believe that there are as much awareness of the possibilities and benefits of TCP/IP, Web services, XML and other such technologies in Europe as there is in North America. Why this is remains a puzzle to me, maybe because much of the IT industry in US based (Microsoft, Cisco, HP, Oracle, etc.). BuilConn Europe in October will be an interesting venue to truly understand the above dynamics, specially for those who are monitoring the progress of adoption of this thing we call convergence on the global arena. The interest level we are getting from IT and Enterprise companies is much stronger than the North American BuilConn events. Note: Konnex Association is the logical consequence of the merging of 3 Associations; BCI (Batibus Association), EIBA (EIB Asssocation) and EHSA (European Home Systems Association) into one single Association. BuilConn Europe, will be cosponsored by the OASIS international standard consortium. BuilConn Europe will also host the first face-to-face meeting of the new OASIS Open Building Information Exchange (oBIX) Technical Committee and will feature information on oBIX standardisation efforts in its program. From the above you can see lots of exciting progress being made in the acceptance of global communication standards for large building automation, hence the transition period for controls becoming true global commodities is becoming reduced.